FOX NEWS – Amatrice, Italy – Italy remains in a state of mourning for the victims of the 6.2 magnitude earthquake that left nearly three hundred people dead, and hundreds more injured earlier this week. As the rebuilding process begins, a Sacramento-based company is among a core group working to rebuild fallen structures, and protecting those that remain standing near the quake’s devastation. 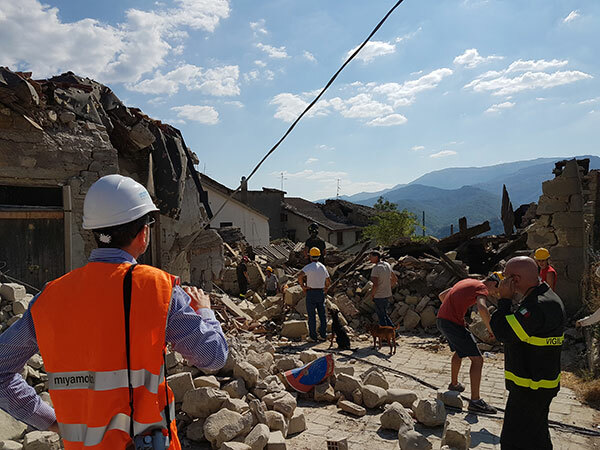 Now that the dust has settled over Amatrice, Italy, and rescue crews have begun to wrap up their search efforts for bodies among the rubble, teams of structural engineers begin their job — figuring out why many of the town’s buildings crumbled like they did, and how to prevent those still standing from doing the same. “We’re seeing a lot of buildings that are built with poor quality materials,” said Devis Sonda, who heads the Italian branch of the Sacramento-based engineering company Miyamoto International. The company responds to areas prone to earthquakes, and help reinforce old buildings that lie in their wake. On Saturday, Sonda’s team surveyed the devastation near the epicenter of the quake. He sent images of the destruction exclusively to FOX40. What was clearly a town of abundant natural beauty now lies in ruin. “Our work will be to check the buildings that are still standing to understand if they are safe or not safe,” said Sonda. Kit Miyamoto, the CEO of the eponymous company, says often volunteers rush to help after natural disasters, but not many have the technical skills that his engineers do. “We are engineers but we want to do more than that. We want to help others. Not only people in Sacramento or California, but globally,” Miyamoto said. The work is just beginning for Miyamoto’s team, and, as engineer Andrea Pollini tells it, it’s already a tough job. Now their work must be done as family members and friends of 291 people killed in the quake morn their loss.